Carmen de Lavallade, Guest of Honor, who appeared onstage tonight, has an extensive and renowned career in dance. She collaborated with choreographers, such as Alvin Ailey, Lester Horton, Agnes DeMille, and Geoffrey Holder, her husband. Ms. de Lavallade has acted, danced, choreographed, and directed for numerous productions, and she has earned Honorary Doctor of Fine Arts Degrees. (Ailey Program Notes). Film clips were shown tonight, and Judith Jamison appeared onstage to greet Ms. de Lavallade. Blues Suite (1958): Choreography by Alvin Ailey; Restaged by Masazumi Chaya; Assisted by Sylvia Waters and Hope Clarke; Music, Traditional; Décor and Costumes by Ves Harper; Costumes Redesigned by Normand Maxon; Costumes for Yancey Special by Jose Coronado; Lighting Originally Designed by Nicola Cernovitch; Lighting by Chenault Spence; Performed by the Company. What a joy it was tonight to hear joyous melodies and see elegant partnering the entire evening. This was in contrast to the more electrically jolting and pulsating cultural pieces that had been quite satisfying, but on a more esoteric, rather than emotional level. This celebration of the blues, set to music, such as House of the Rising Sun and I Cried, had pathos and humor, sassiness and sultriness, and some of the best role play in Modern Dance that I've seen in years. In fact, Dwana Adiaha Smallwood and Amos J. Mechanic, Jr. were brilliant in a fiery duet between two lovers, with ladder, black shawl, and umbrella, before Ms. Smallwood leaps into his arms and is carried offstage. Mr. Ailey choreographed this piece in 1958, and it looked as modern and au courant as it could be. This piece was reminiscent of my two extended visits to New Orleans, with the visions of lace and feathers, as well as the combination of red, black, and white. The partnering was all perfection, and this was the Ailey Company at its finest. Sarong Paramaribo (1950): Choreography by Lester Horton; Restaging by Carmen de Lavallade after the original; Assistant to Ms. de Lavallade, Hope Clarke; Music by Les Baxter, "Jungle River Boat"; Costumes Designed by Geoffrey Holder, based on original design by Lester Horton; Costumes Constructed by Jose Coronado; Lighting Designed by Cynthia Caulfield; Performed by Linda-Denise Fisher-Harrell, Linda Celeste Sims, Bahiyah Sayyed-Gaines, Asha Thomas, Briana Reed. This work, choreographed in 1950 by Lester Horton, was reminiscent of Nijinsky's works. Created for an ensemble of women, this exotic piece required muscular movements of the neck and shoulders that appeared to be double-jointed. The sarongs in pinks and reds were effervescent and ethereal. The headpieces were also well suited to this unusual re-staging by Ms. de Lavallade, with warm lighting by Cynthia Caulfield. Sweet Bitter Love (2000): Choreography by Carmen de Lavallade; Assistant to the Choreographer, Dudley Williams; Music by Buffy St. Marie, Sung by Roberta Flack, by Sam M. Lewis and Fred Coots, Sung by Donny Hathaway, by Van McCoy, Blackwood, BMI, Sung by Roberta Flack; Costumes by Geoffrey Holder; Lighting by Chenault Spence; Performed by Renee Robinson, Glenn A. Sims. Every once in awhile, a familiar dance company surprises me with a work I have not seen, and one that I vow to see again at the earliest possible opportunity. Sweet Bitter Love was such a work. This was the most rare and romantic piece, about which I am familiar, in the Ailey repertoire. Renee Robinson and Glenn A. Sims, barefoot and elegant, mesmerized the audience with their impassioned choreography, indicative of Ms. de Lavallade's imagination and innovation. This is a piece that brings out the charisma and character of Principal dancers, with Ms. Robinson's ability to enrapture and entrance and Mr. Sims' ability to use his extraordinarily athletic presence in such an emotionally daring role. The songs interpreted by Roberta Flack and Donny Hathaway were evocative. Kudos to the soloists and to Carmen de Lavallade. Revelations (1960): (See December 8, 2002, December 12, 2003, and December 16, 2003 Revelations Reviews). 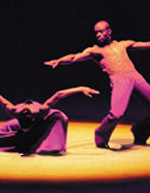 Choreography by Alvin Ailey; Music, Traditional; Décor and Costumes by Ves Harper; Costumes for "Rocka My Soul" Redesigned by Barbara Forbes; Lighting by Nicola Cernovitch; Performed by the Company. For my final viewing of Revelations for this season, I thought of the rich culture of the African American experience and the ability of Alvin Ailey to extrapolate from his own background and resources to envision this piece, with all its energy and religious connotations. In no way does it appear to be secular, but rather a metaphor for the contrasts of the human conditions of despair and hope, repentance and humility, sorrow and celebration. Kudos to Alvin Ailey and Judith Jamison, and kudos to the entire Alvin Ailey Dance Theater.